Can you say Lake View!!?? WOW!! Is an understatement when you see this amazing Viewscape. Wishin' I Was Fishin' is the Perfect Getaway for a family, couple or group of friends. This cabin is located in the Aska Adventure Area of Blue Ridge, Georgia. So close to hiking and biking and waterfalls!!! 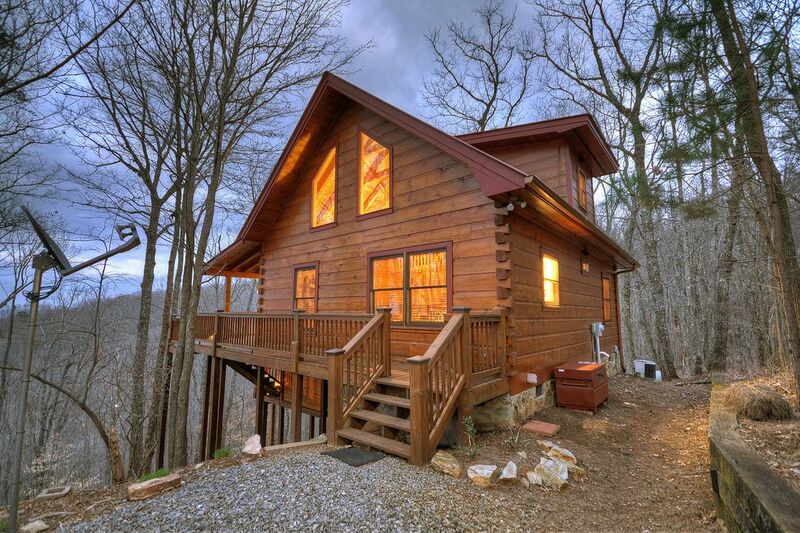 All that Blue Ridge has to offer is at your fingertips from this great vacation cabin. You'll wind up to the top of the mountain to the very end where you'll reach this magnificent cabin. Walking onto the deck the very first thing you'll encounter is the amazing view of Lake Blue Ridge. When you step inside you'll love the quaint feel of the beautiful mountain décor. The open living room with a wood burning fireplace and flat screen TV equipped with Satellite flows into the dining room and fully equipped kitchen. The main level hold 2 queen bedrooms and a full bathroom. Walk up to the master suite on the 2nd level to find a King log style bed, sitting area overlooking the view and full bathroom. On the Deck you'll find rocking chairs and gas grill. Walk onto the lower level to a fabulous lounging area and Hot Tub to while away the hours and enjoy the breathtaking views and fresh mountain air!! The cabin is equipped with Wifi. Amazing cabin with spectacular views. We had a great weekend at the cabin. Traveling up the steep narrow road was a bit nerve racking that first time, but luckily we never encountered another resident/guest coming in the opposite direction. Would not recommend driving it in low visibility. That said, the cabin is great - beautiful, clean, and comfortable. The loft bed was great! The Food Lion nearby was very convenient. The cabin had some basic spices. We were disappointed there was not a cutting board. There was firewood for the fireplace, but it was left out in the rain, so we had to dry it out. Overall, would definitely stay again. The view of Lake Blue Ridge is absolutely spectacular from the front porch of this lovely cabin. Once the weekend became drizzly, we were just as pleased with the cabin's cozy, (and spotless) interior. Plenty of kitchen utensils are provided for cooking, which were put to good use for one dinner and two breakfasts. One suggestion: don't forget to bring firewood if you think you might want to use the fireplace. Quiet secluded location but just 10-15 minutes from downtown Blue Ridge. All the essentials are available including a full kitchen. Just bring food and toiletries and maybe stop on Aska Road before arriving to get some firewood. Private hot tub on deck was great. There are even two robes in one of the downstairs closets. Upstairs loft bedroom is open to the rest of the cabin so it would not be very private unless there's just two of you as was the case for us. Cabin was neat and clean. Decor is somewhat dated but it is a cabin, not the Ritz, so that's no big deal. You don't need a 4WD to get up the steep road but there are some potholes so be careful if in a car. Would recommend arriving before dark because single lane road up mountain to cabin could be challenging the first time you travel it, especially in the dark. The best thing about this cabin is its view. It's incredible and the pictures don't do it justice. Incredible view. Wouldn't drive there for the first time at night like we did. It's at the very top of the mountain and difficult to navigate in the dark. Only one TV...and doesn't get all sports channels so not the best for football weekends.